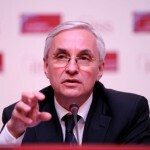 The online foreign affairs journal The National Interest published an opinion piece by INSOR Management Board Chairman Igor Yurgens on the outcome of the recent presidential elections in Russia and what this means for Russia’s future. "Putin’s return to the Kremlin does not necessarily restrict the prospects for Russia’s political and economic modernization or limit opportunities for improved relations with our partners in the West. To the contrary, progress in these areas could even be accelerated," Yurgens writes. "But this is only possible if the conclusion of the election campaign is also accompanied by an end to the escalation of social tensions, an end to the confrontational rallying of people on the streets, and an end to the divisive calls to arms against internal and external enemies. Progress is possible, but broad and inclusive public dialogue is prerequisite."